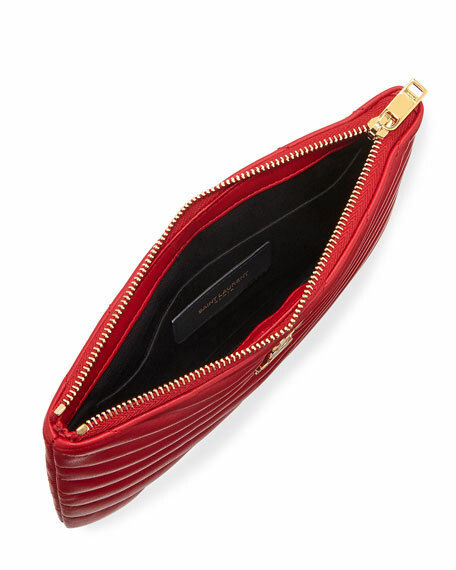 Saint Laurent chevron-quilted calf leather pouch. 5.5"H x 7.5"W x 0.6"D.
Balenciaga small pebbled leather handbag in allover graffiti print. Rolled top handles with hanging covered key. Removable, adjustable shoulder strap. Balenciaga small pebbled leather handbag in allover graffiti print. Rolled top handles with hanging covered key. Removable, adjustable shoulder strap. Zip-around top closure; secured by side lock. Interior features pockets. Metal feet protect bottom of bag. 11.4"H x 14.2"W x 5.1"D. Made in Italy. Balenciaga extra small pebbled leather handbag in allover graffiti print. Rolled top handles with hanging covered key. Removable, adjustable shoulder strap. Zip-around top closure; secured by side lock. Interior features pockets. Metal feet protect bottom of bag. 8.7"H x 10.2"W x 4.7"D. Made in Italy. Loewe tote bag in soft grained calf leather with smooth leather trim. Flat top handles. Removable shoulder strap. Open top.